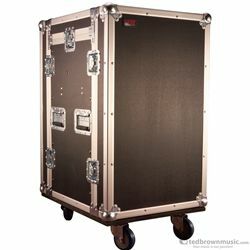 ATA Wood Flight Pop-Up Console Rack Case; 10U Top 12U Bottom with Casters. 9mm plywood construction with laminated exterior with red recessed twist latches and spring loaded rubber gripped handles. Heavy duty commercial grade plated hardware and reinforced stackable ball corners. 3.2mm thick front and rear rack rails with tongue and groove extruded aluminum valance. Mobile 19" console rack with pop-up top-loaded rack. The top rack uses a pop-up ratchet system for transporting flat then elevating to various angles. 4" heavy duty industrial casters, two of which are locking and two spring loaded recessed handles on each side for easy lifting to stage or truck.